I had a look at the image I was planning to colour and stamped it three times in Memento Tuxedo Black onto X-press It Blending Card. The first image I've coloured the top of the image in full detail. The bottom I've I've only applied the base colour because this will be covered by other layers. This way if there are any parts peeking out from underneath the layers it won't be noticeable, but you aren't spending a lot of time or ink colouring it either. For the second image, I've coloured only the bottom part of the image. 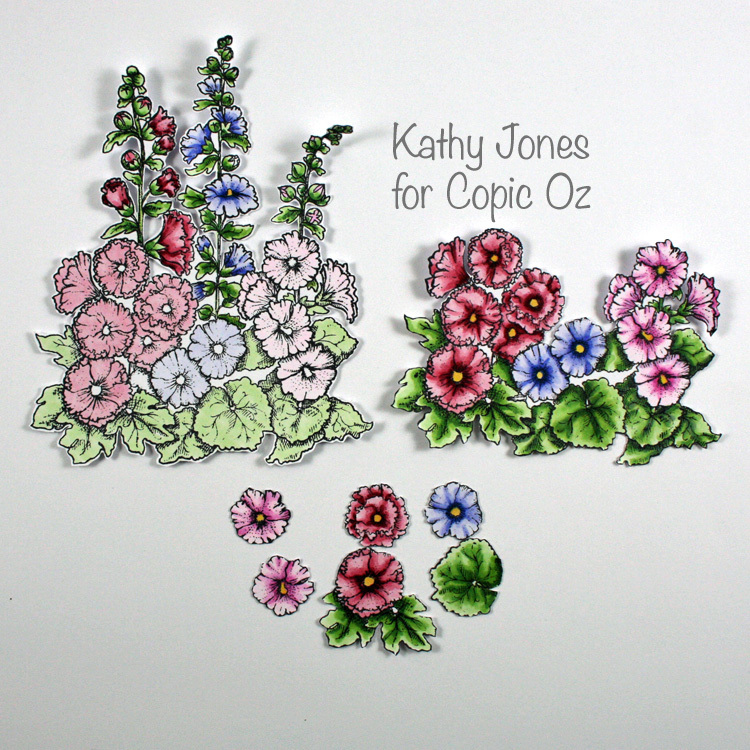 For the third image, I've only coloured small parts that look like they would be in the foreground - for example the flowers that are in front of others. Next I cut out my three images. You don't have to cut out your base image, but I had a plan for mine and did so - which is a LOT of fussy cutting! The second image is all one piece and the third image is in six pieces. 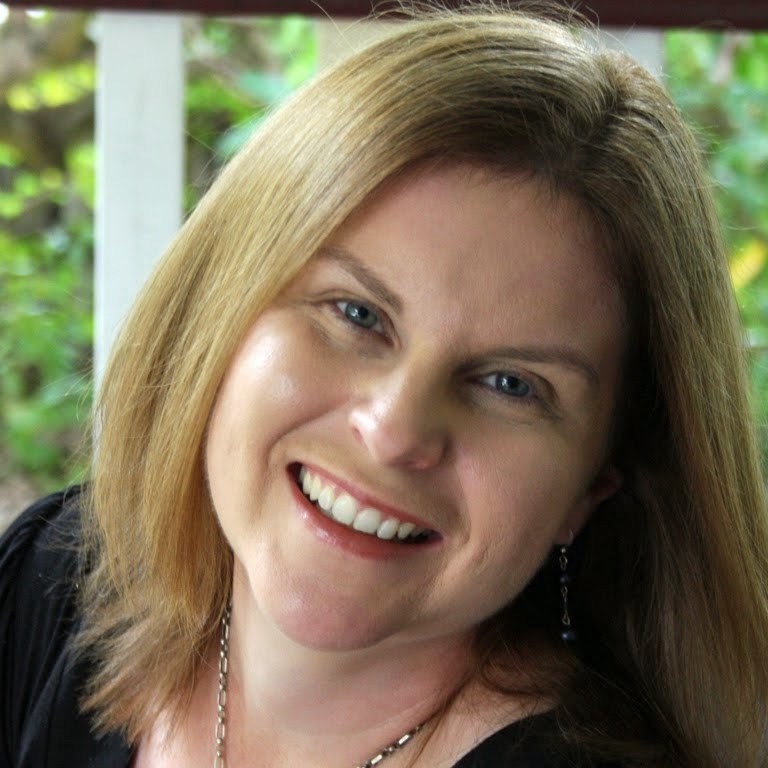 It's really important that you cut the layer pieces close - you don't want those white lines around them! 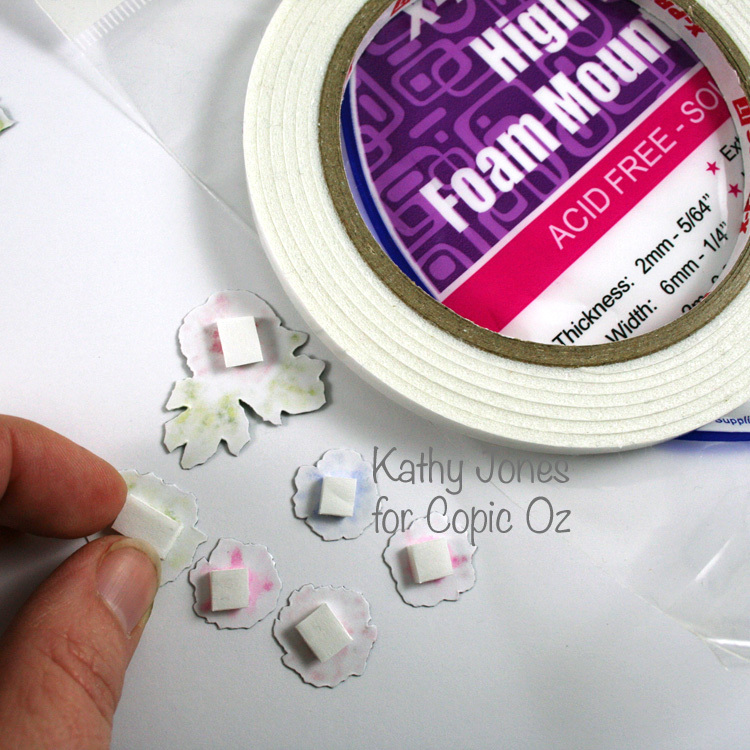 Add some X-press It High Tac Foam Mounting Tape to the backs of each piece (except your base image). I like the High Tac because it really holds the pieces where you want them to be. Take your second image with the foam tape attached and place it over your base piece. 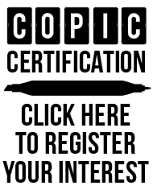 Make sure you line it up well so that you can't see the image underneath! Then attach all your individual pieces, also on foam tape and carefully attach them, once again covering the image underneath. So now that your image is full of dimension, how can we make this into a Faux Living Card? Take a piece of card, scoring it twice in the middle to create a wide spine. 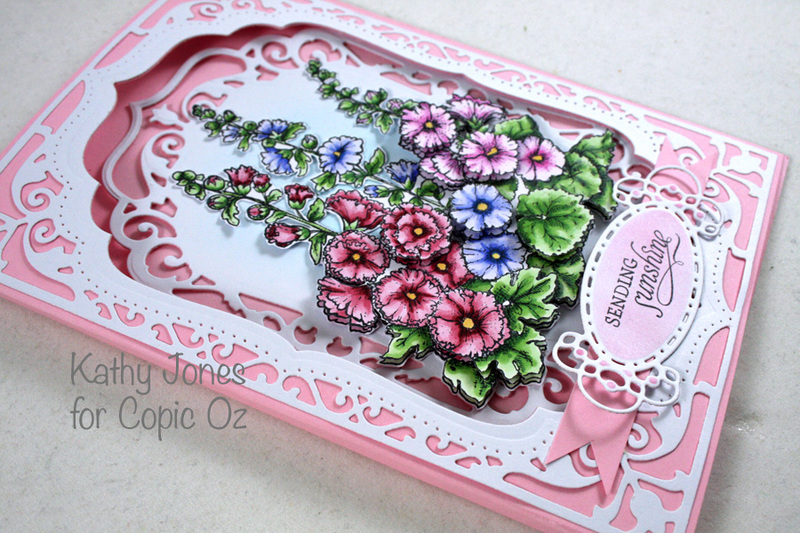 I've made this one to fit the die cuts from Spellbinders Elegant Labels Four dies. 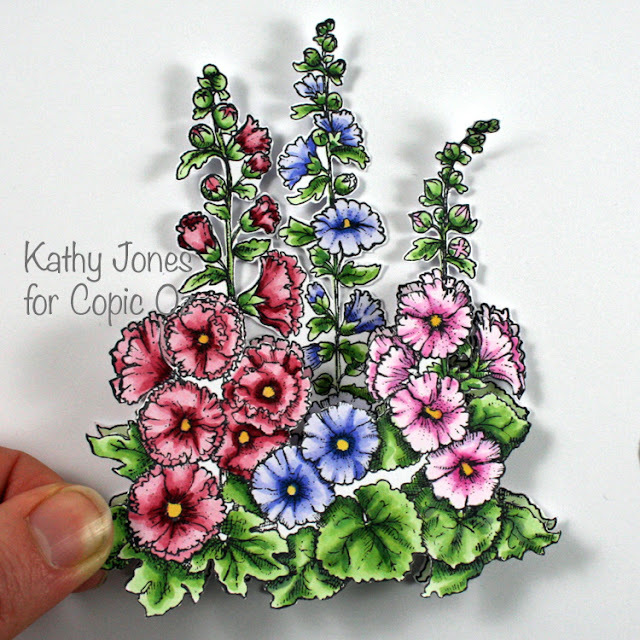 I've cut white with these dies to create a beautiful frame and background for the Hollyhocks. 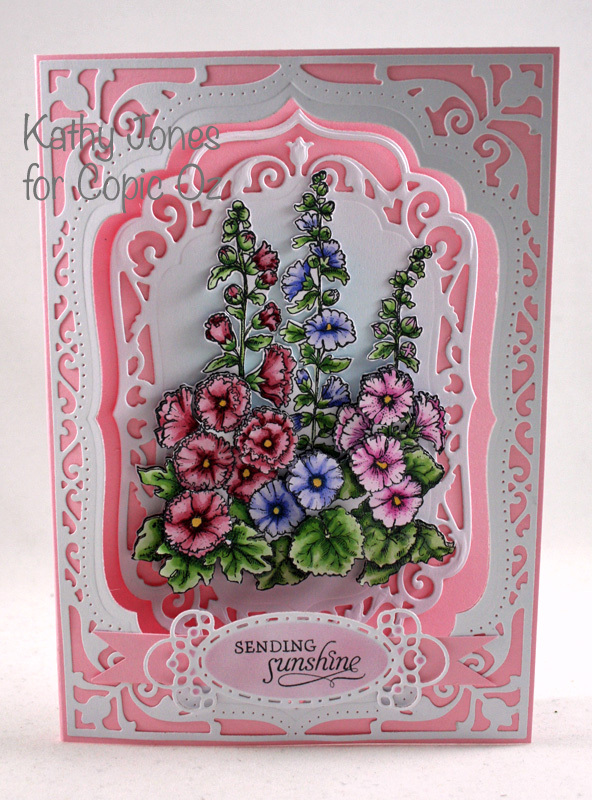 The sentiment is also from Hollyhocks stamp set and I've cut it out using the die from Spellbinders 5x7 Detailed Scallops, airbrushing the middle using R81 Copic. And there you are!! Your very own Faux Living Card, one that will not die and your recipient will treasure forever! Hope you've enjoyed today's tutorial! Hi All - it's my turn to share some more ideas with you all to use in your Copic Art Journal, and this week I'm hoping to inspire you to try your hand at doodling.. 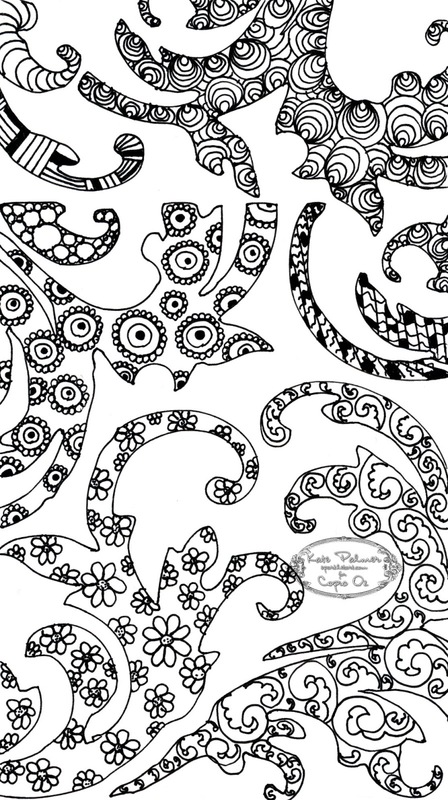 There are many types of doodling, there is the increasingly popular Zentangling, there is tangling, there is Stentangling, and there are doodles - Phew no wonder people get confused! Today I am talking about simple doodling, this is often quick, fun and once you begin it's difficult to stop. Whether you know it or not, most of us doodle without even realising it. 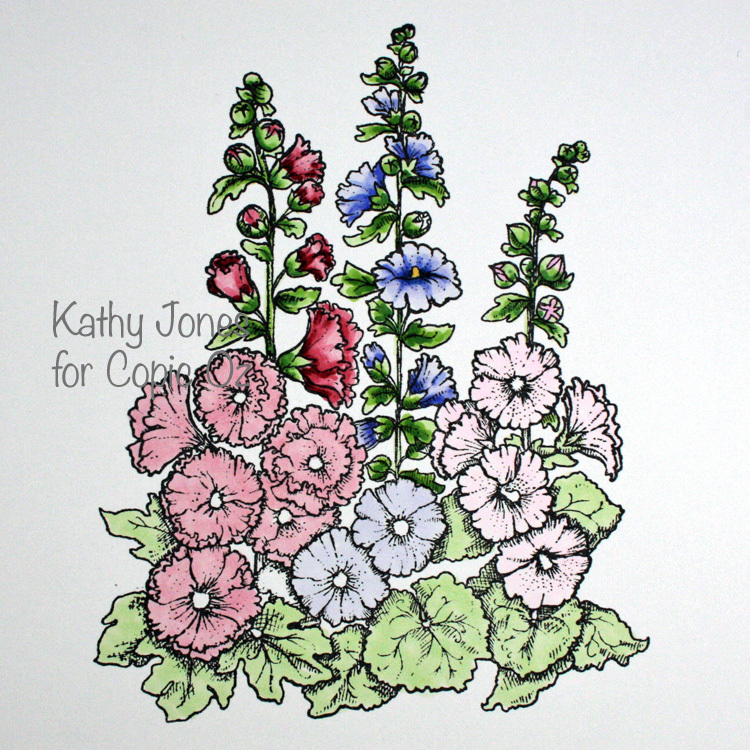 It can be as simple or as fancy as you like, the doodle itself can be the art or it can compliment the art. My job today is to give you some ideas so you can begin to incorporate these little drawings into your Copic Art Journal - or any art. 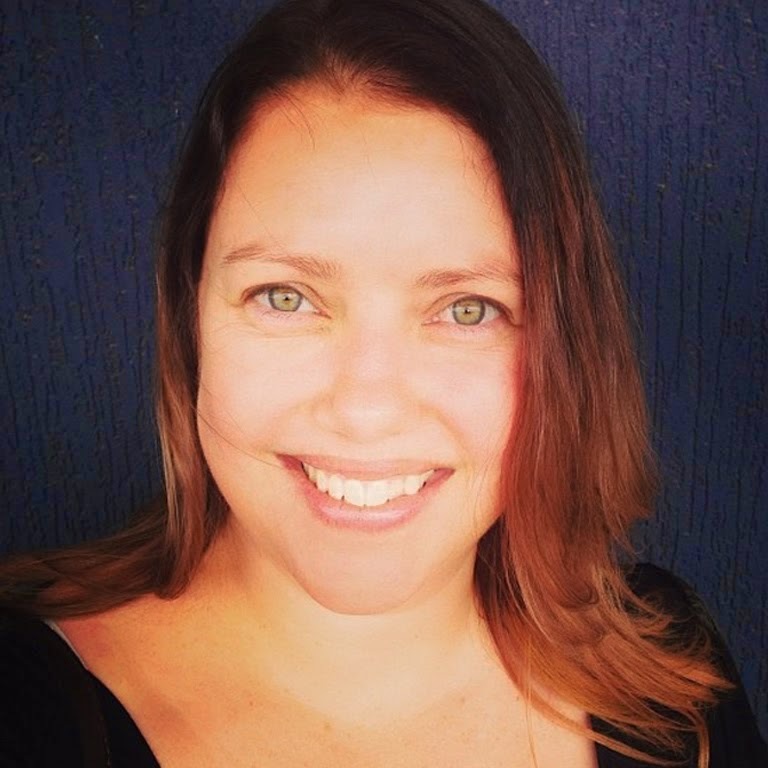 But where do you start - what should YOU doodle? 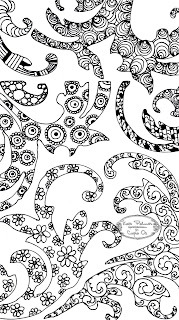 This is a tough one as doodling is very personal, I can tell you I love to doodle circles, lines and floral patterns - but these designs may not be interesting to you. I sometimes doodle images, other times I just doodle shapes or patterns - it's all doodling. The easiest thing to do is to look around you, can you see a pattern a shape that you like - then try doodling those or drawing them and doodling within those shapes. It's much easier to do if you draw something you like. Here are a few ideas, simple things I doodled with my 0.5 Copic Multi Liner while watching TV, see they don't have to be amazing! If you need a bit more inspiration you can check out my 'Doodles' Board over on Pinterest. To find your doodles try drawing some squares (about 5cm x 5cm) and just draw little doodles within these, then use these on a larger scale. These simple doodles, look more interesting when viewed as a whole and even better coloured with Copics! The joy of doodles is that they can be as simple or as complex as you like. 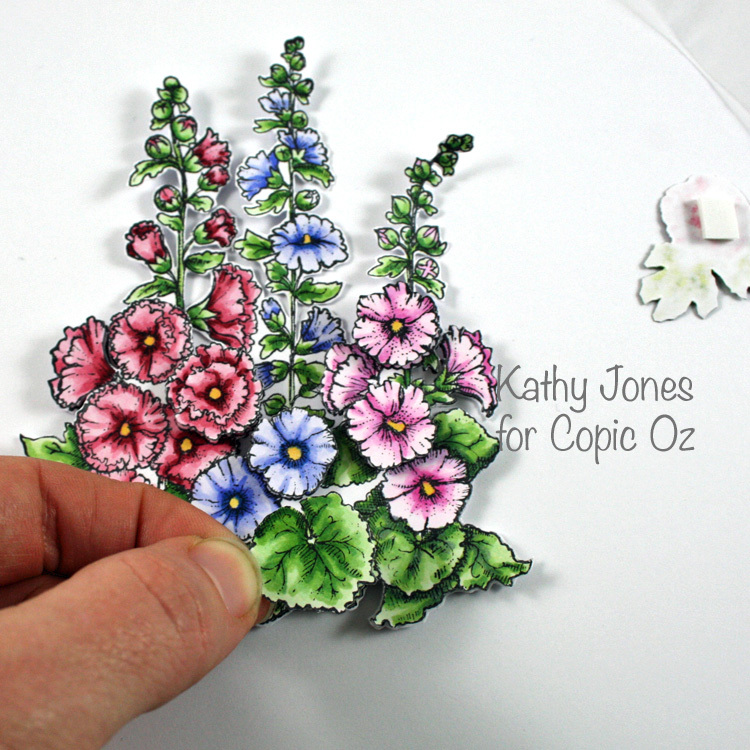 This is where I got really excited about doodling, with a little colour and a bit of confidence, you can easily incorporate your doodling into whatever art or craft you already create, why not doodle on small pieces of card stock and turn these into the main element on a card, or bookmark or even framed art, or doodle designs around your photos on your scrapbook pages. Once you begin the possibilities are endless. WHERE AND HOW TO USE DOODLES? Using a Copic safe ink like Memento, stamp your image onto your card or journal. 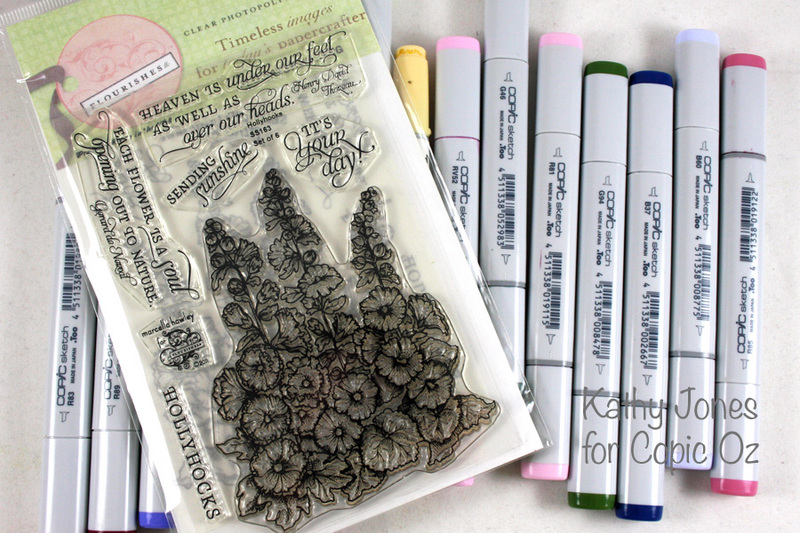 Add doodle designs with Copic Multi Liners to part or all of your stamped image, here I've doodled designs onto Marci's Kimono to add a pattern. 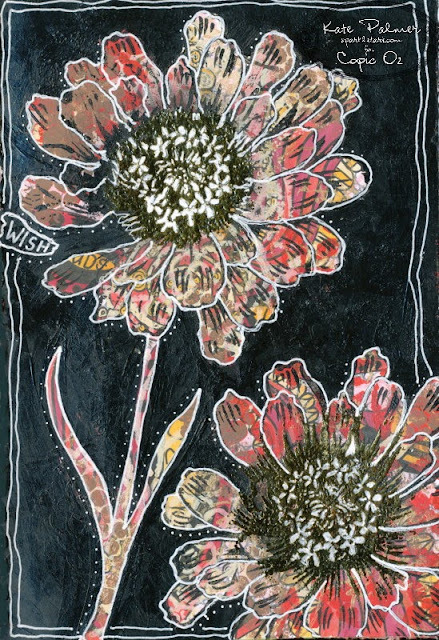 Whether your image is stamped, collaged or drawn, this is a fun way to add a little whimsy to your art. 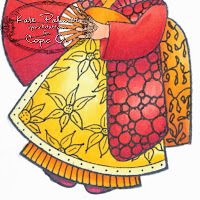 Try a doodle hair-do, or doodles on a dress, even a doodle body to draw attention to the focal image. 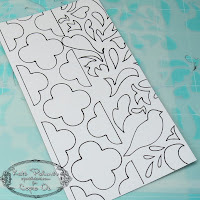 Using your Copic Multi Liner (I like Grey or Black) use a stencil to draw a pattern onto your card or journal. 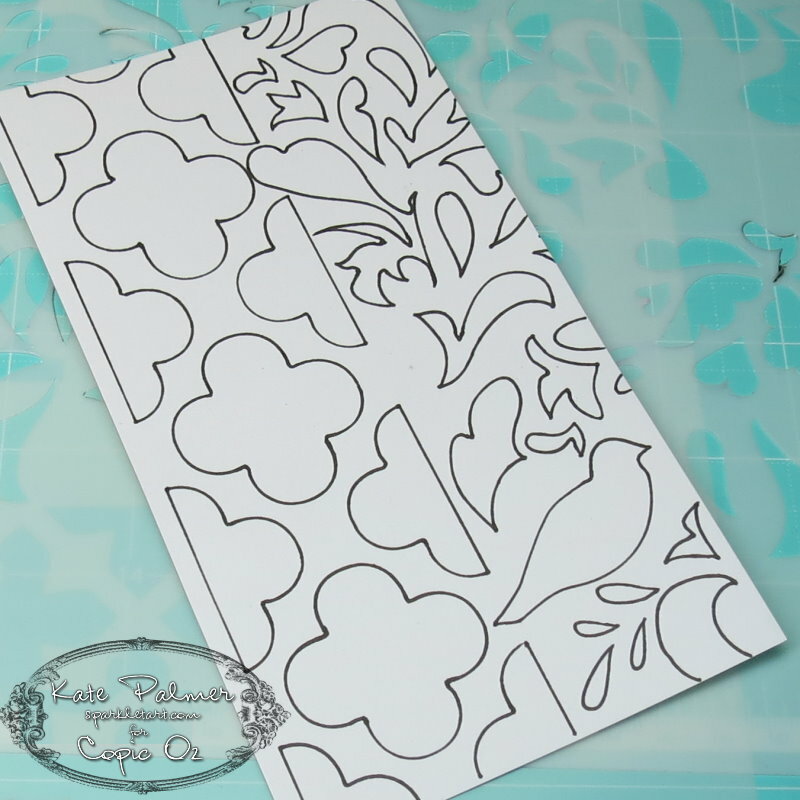 Using the pen of your choice, fill in around the pattern or within the pattern (or both) with doodle designs. 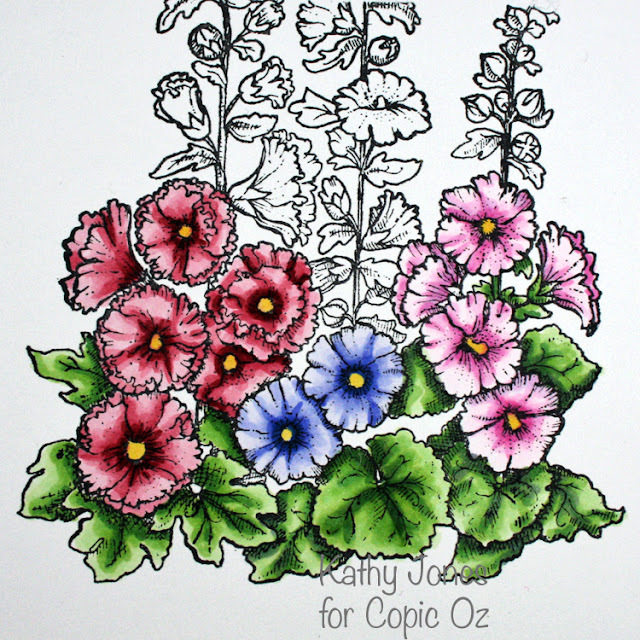 Leave it as is or add colour if desired. 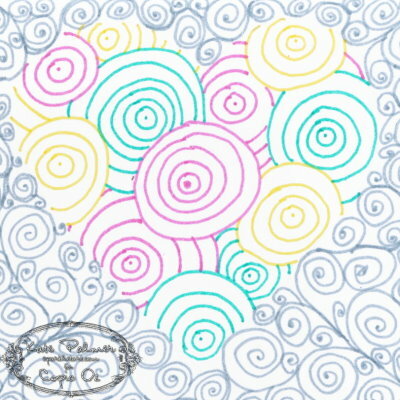 Use your doodled designs to decorate planners and diaries or filing folders. I can't be the only person who still uses a diary or smash book! Get to it and start dressing up your dividers with a doodle or two, come to think of it you could apply this to your files for work or home, address books, recipe cards etc. Using your Copic Multi Liner draw bold a capital letter (or word) with space inside the letters to add doodling or colour. Use your favourite supplies to add doodling either within the letters or around the letters, again coloured or uncoloured the choice is yours. 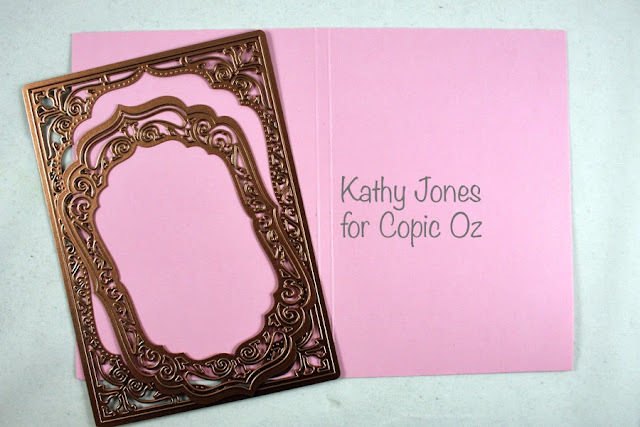 On a more manageable scale, this would make wonderfully fun and personal name tags or place tags for weddings and parties! 1. 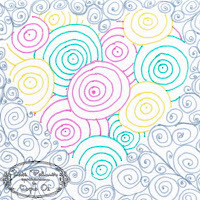 Try drawing a heart (or a few) and adding doodling within or around the shape to embellish it, smaller shapes are best with single patterns, larger shapes can handle a few different patterns at once. 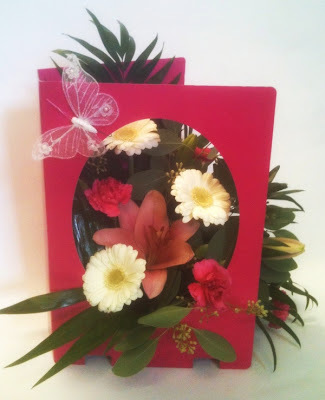 Now I chose a heart, you may prefer a flower, a circle, an animal - pick a shape and have a play. You can use these simple doodles on cards or page backgrounds, and it's all drawn by you - so an original piece of doodle art! 2. 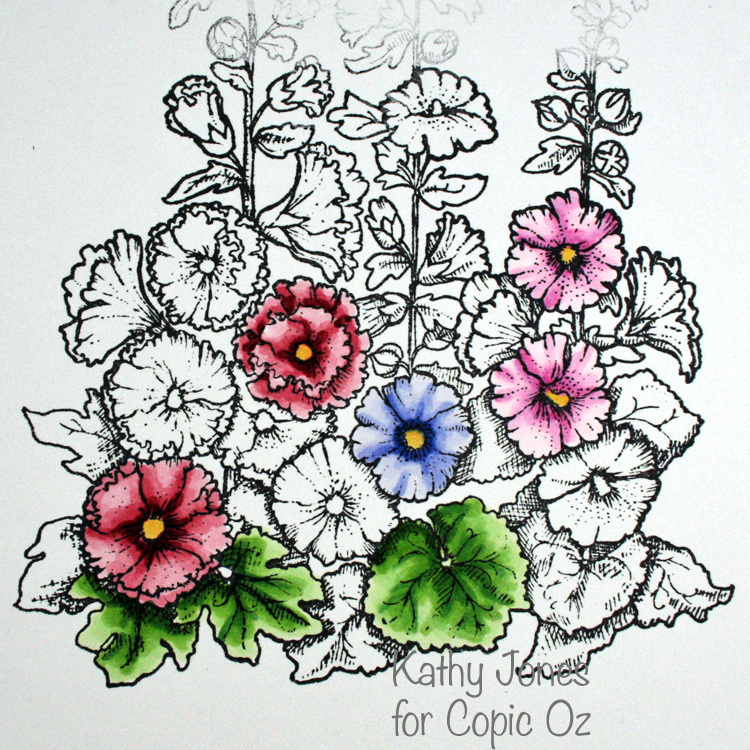 Draw your heart in pencil and doodle around or within it, then rub out the pencil - your designs create the shape, I really do love the Copic Multi Liners for this, the coloured ones in particular. Now just a note here, if you draw over lead pencil with either Copic markers or Copic Multi Liners, then the pencil covered by the Copic will not erase - strange but true. 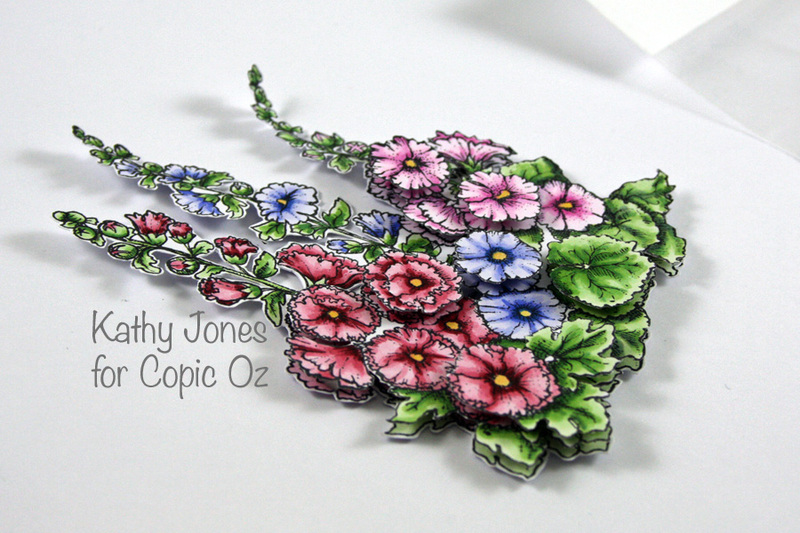 Enhance your art by using doodles and doodle patterns in your backgrounds, a little or a lot it's up to you - just make sure you are using pens which won't bleed if you decide to colour over the top - I love the Copic Multi Liners for just this reason - they are life proof! When you are feeling a bit more confident, try creating scenery with doodles or using doodles as your art. 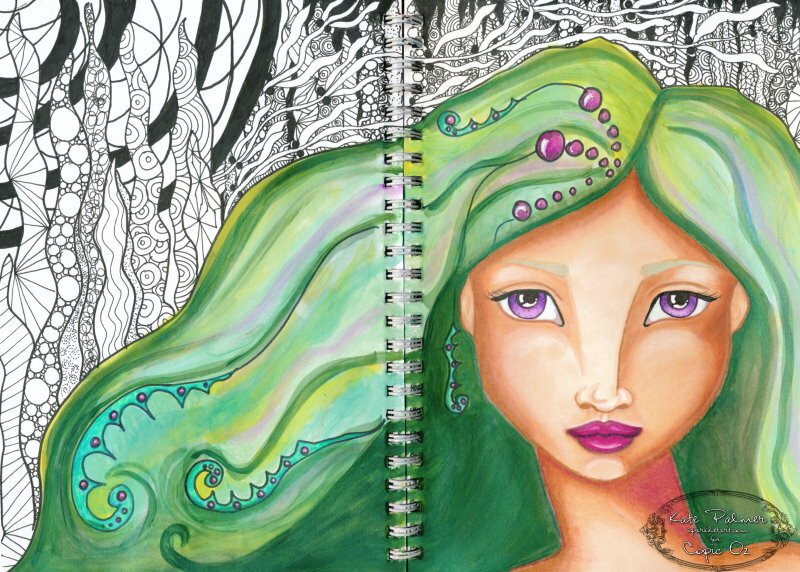 Doodles aren't just 'unconscious drawing' anymore - they are now entering the realm of DOODLE ART. 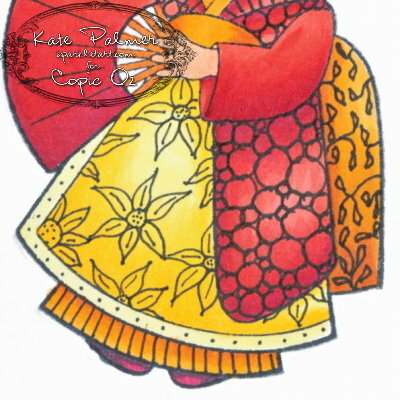 hair coloured with Silks - all doodling created using 0.3 & 0.5 black Copic Multi Liners. Do you you remember the doodle right from the beginning of this post - the one I drew while watching TV? This is what I used it for, I added a little stenciling, some gold foil, stamping, black paint and white Molotow marker and turned it into this, even the simplest doodle can turn into something special.